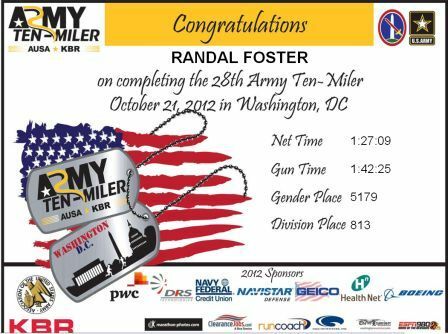 Army Ten-Miler is in the bag. I wish I could say that I got through with no problems, but lung issues cropped up, with me (and my running partner Kori-more on her later) noticing a change at mile 3, and getting slammed at about the 6-mile mark. The rest of the run was pretty miserable, but I was focused on keeping going. I think I might have been better off taking an albuterol break earlier than after the finish, but I didn’t… I’m still learning about how to manage this, and this race was a good lesson that I don’t have it all figured out yet. Although the last mile was a real struggle I was very glad to finish fairly strong even with the issues, and I credit this to my running partner. Kori was wonderful during the race, a constant source of motivation and happiness at the beginning, and essentially a living life-line at the end. She was very good at keeping me at a pace where I was well-challenged but not actually losing the battle against my lungs. It was a remarkable show of perception on her part and an enormous help to me. I owe a large part of this race to her, and she’s a marvelous example of how a good running partner can pull you up to a level you didn’t know you could reach. THANKS KORI!!! While I was dealing with my own problems, I couldn’t help but notice folks around me who were dealing with far more serious problems. There was a large contingent of wounded warriors and their support teams at the race. I would be tempted to call myself more fortunate, but to me that would imply that they were less fortunate. In their case, fortune had nothing to do with it. They willingly marched into harm’s way, risked and sacrificed part of themselves for the greater good of our country, and I owe them a debt I wish I could repay. They were the true heroes of the day and I felt grateful and honored to run alongside them. I give them all my most humble and sincere thanks and appreciation. We brought six folks to the race that day, and we all ran well! It was a true pleasure to be on the team with Kori, Stefan, Jamile, Carla, and Nicole and play in DC with them before and after the race. We came in 32nd out of 163 teams in our division… not too shabby! In other happy news the Des Moines Marathon and Half-Marathon was the same weekend, and we had lots of folks from our running group who ran. Natalie led a pace group to help newer runners meet their goals (in my eyes, one of the nicest services a runner can volunteer to give to other runners) and we heard on the way back that the incredible Art met his goal of running a Boston Qualifying time… an amazing accomplishment for any runner. All-in-all, it was a wonderful weekend!